Green Bushes; or, A Hundred Years Ago, author John B. Buckstone. Miami, later Mme. St. Aubert, was played by Céline Céleste, Evelleen (a child) Miss Robins, Geraldine Mrs. Frederick Yates and George Kennedy by James Hudson. The new drama of "The Green Bushes, or a Hundred Years Ago" produced this week at the Adelphi has quite brought about a revival of its glories and adds another to the list of masterly productions for which this theatre is indebted to the talent of Mr. Buckstone. It possesses in an eminent degree all the qualities for which that dramatist is so distinguished--a naturally sustained interest, working through a series of the most dramatic incidents with the utmost lucidity and neatness of construction, abounding in coups de théâtres, which, whilst they are of a striking description, bear a freshness about them which saves them from mere conventionality. The interest is spread over a period of three years, beginning from 1745, and the scene is chiefly in Ireland, although in the second act we are transported to the wilds of America. The first act commences with an Irish fair, all the peasants being discovered before a whiskey booth, and amongst them we find Wild Murtogh (Mr. O. Smith), a gentleman desirous of bettering himself and not particular about the means. He is at this moment the proprietor of a lucky bag and invites the peasants to take a dip. 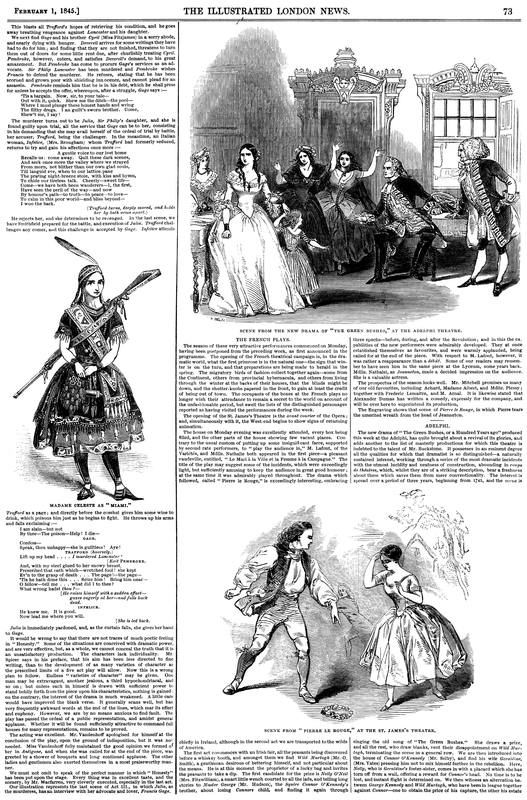 The first candidate for the prize is Nelly O'Neil (Mrs. Fitzwilliam), a smart little wench courted by all the lads, and telling long stories to Master George (Mr. Hudson), the Squire Conner O'Kennedy's brother, about losing Connor's child, and finding it again through singing the old song of "The Green Bushes." She draws a prize, and all the rest, who draw blanks, vent their disappointment on Wild Murtogh, terminating the scene in a general row. 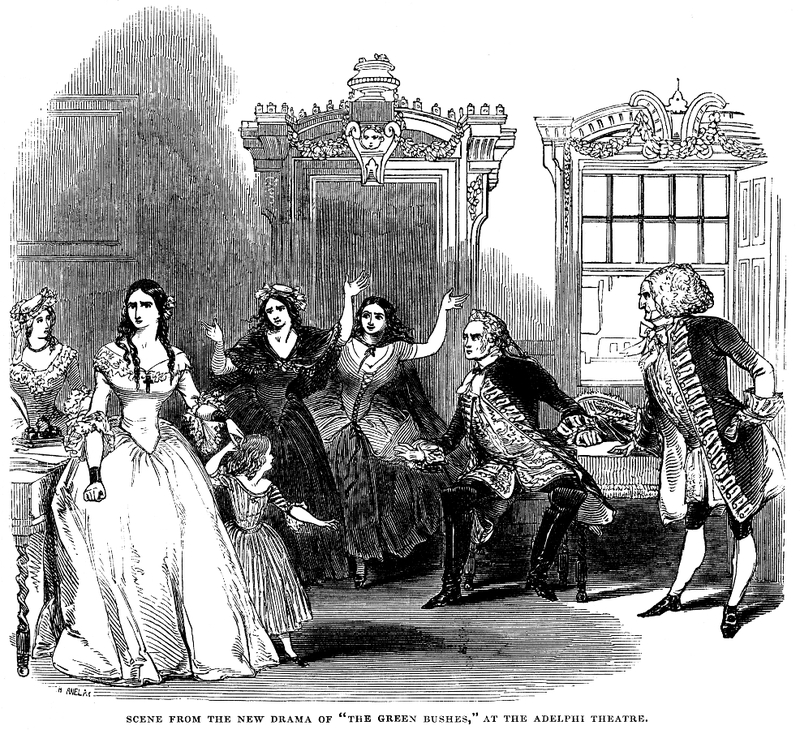 We are then introduced into the house of Connor O'Kennedy (Mr. Selby), and find his wife Geraldine, (Mrs. Yates,) pressing him not to mix himself further in the rebellion. Here, Nelly, who is Geraldine's foster-sister, comes in with a placard which she has torn off from a wall, offering a reward for Connor's head. No time is to be lost, and instant flight is determined on. We then witness an altercation between George Kennedy and Wild Murtogh, who have been in league together against Connor--one to obtain the price of his capture, the other his estate but are now at odds, as George would prefer assisting his brother's flight. The last scene of the act is a barn, where the peasants are assembled for a dance, Wild Murtogh officiating as piper. The jigging is interrupted by the appearance of Connor and his wife, who have come to bid them farewell. The barn door is opened, and a boat appears on the water, into which Connor steps. At that moment a trap door springs open, and a party of soldiers concealed there by Murtogh's information, rush upon the rebel. His wife interposes her body before them, striking up the muskets levelled at him, and the boat moves off, a tableau being formed of the peasantry overpowering the soldiers. In the second act, the curtain rises on a hut near the borders of the Mississippi. It is inhabited by a strange couple: Miami, Madame Celeste, the wild huntress of the Mississippi, the orphan daughter of a French officer who married an Indian squaw--an extraordinary being, who has found a mate in the escaped rebel Connor, to whom she is passionately devoted. Connor is no less fascinated by this strange creature, half savage and half civilized; but is occasionally tormented with the bitter remembrance of the wife and the child he has left at home. At last, as he is left alone, remorsefully pondering, for the hundredth time, over a letter from his wife, a figure, pale and faltering, appears on the bridge that crosses to the entrance of his hut. It is Geraldine, who has, crossed the Atlantic after her husband, and wandered in search of him. Connor is overwhelmed at the meeting; joy at seeing his wife again, and dread for the consequences of her appearance distract him. Suddenly, whilst she is in his arms, Miami appears on the bridge, starts at the sight, and then stands fixed, her eyes riveted on the couple like a tigress watching her prey. They move, Connor leading his wife to a place of concealment, and Miami follows in the track bursting with fierce jealousy. At last, overpowered by it, she levels her rifle at Connor, and as he is embracing his wife the bullet pierces his breast. A shriek follows, and Geraldine rushes to the spot where Miami is, and, ignorant that she did the deed, entreats her to Connor's assistance. Miami is thus dragged to witness the dying agonies of her faithless companion, and when he has breathed his last, she mounts a rock and throws herself into the stream--the scene being on the banks of the Mississippi, which is illuminated by the ruddy glare of the setting sun. Just after her plunge, a raft, bearing a party of French officers to their homeward-bound ship, appears, and they are seen to raise the body of Miami from the water, the curtain descending on the tableau. 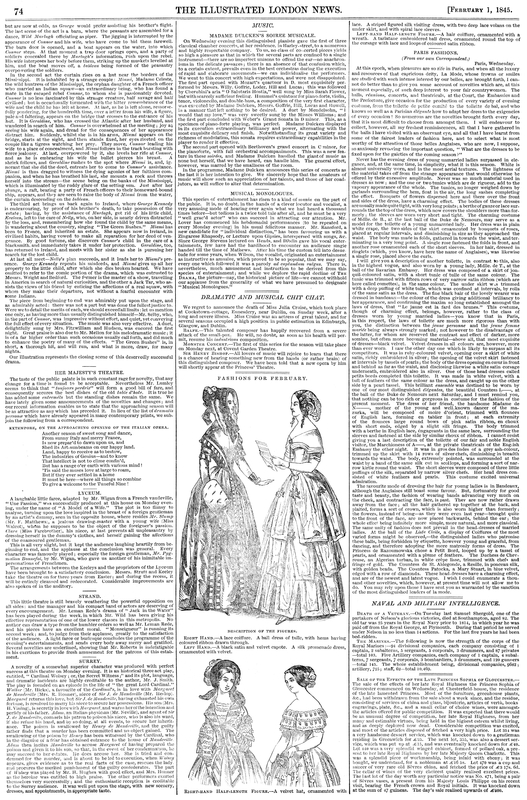 The third act brings us back again to Ireland, where George Kennedy is endeavouring, by proof of his brother's death, to take possession of the estate; having, by the assistance of Murtogh, got rid of his little child, Eveleen, left to the care of Nelly, who, on her side, is nearly driven distracted by the loss, and, remembering how she found the child by the same means, is wandering about the country, singing "The Green Bushes." Miami has been to France and inherited an estate. She appears now in Ireland, in civilized habits, having vowed to make all reparation for her deed of vengeance. By good fortune, she discovers Connor's child in the care of a blacksmith and immediately takes it under her protection. Geraldine, too, has returned to Ireland and meets with her sister as she is pursuing her, search for the lost child. At last all meet--Nelly's plan succeeds, and it leads her to Miami's presence. George Kennedy repents his misdeeds, and Miami gives up all her property to the little child, after which she dies broken hearted. We have omitted to refer to the comic portion of the drama, which was entrusted to Messrs. Wright and Bedford. The former is the master of a show, travelling in America in search of natural curiosities, and the other a Jack Tar who assists the views of his friend by enticing the affections of a real squaw with whom they make their departure, not without a fearful encounter with some Indians. The piece from beginning to end was admirably put upon the stage and as admirably acted: there was not a part but was done the fullest justice to. Were we to detail the merits of each, we should exceed all limits: let us mention one only, as having more than usually distinguished himself--Mr. Selby, who, in the part of Connor, was impressive without effort, and quiet, yet conveying the full effect of every situation. The music was also very effective. A duet, delightfully sung by Mrs. Fitzwilliam and Hudson, was encored the first night. Great praise is also due to Mr. Mellon for his melodramatic music; it is of a far higher order than such occasions usually call forth and did much to enhance the poetry of many of the effects. "The Green Bushes" is, in short, a thorough hit, and will run, and what is more, draw, for many nights. Our illustration represents the closing scene of this deservedly successful drama.